Making a privacy screen with plants is one of the most practical things you can do with your container gardens. It can easily be accomplished with tree-type plantings and bushy shrubs or vining plants grown on a trellis. Before you plan your screen, consider the amount of light your balcony receives. If you want to construct a screen because other buildings are very close, you will probably not receive much natural light and will need to choose plants for your screen that need partial shade to full shade growing conditions. What is the height of your balcony? Do you want to completely enclose your space? Or maybe you would rather have a partial screen that affords privacy when you are seated on your balcony, or in your home. A partial screen would allow some natural light into the balcony area, or your apartment, and perhaps allow for some type of view if you have a desirable one. When selecting plants, make sure their mature height is within your desired height range, and that you add the height of the planter into the overall number. When selecting containers to create the privacy screen with plants, choose a row of the same pots, or use boxes that can easily be lined in a row. Boxes allow room for root growth that trees or shrubs need without being too heavy. They are also weather resistant. It’s a good idea to put your large containers on wheels or casters so that you can rotate them from time to time which allows the tree or shrub to get some light exposure on all sides, or you can move them for other reasons if you desire. From left – juniper, bamboo, ornamental grasses, arborvitae. Under plant the evergreens or privacy plants with flowers to add color and interest. Arborvitae -this is an evergreen that grows quickly and does well in a confined space. You can line them up with no problem. they can grow several feet a year and provide all year privacy. Bamboo – Bamboo grows fast and makes a great privacy screen quickly. Types such as sasa palmata, nandina domestica (heavenly bamboo)and hedge bamboo are good choices. Some bamboo can be invasive so watch out for those types as they will require “taming”. Bamboo is also a light plant so you may need to add a little gravel to the bottom of your containers or secure them in some way so they won’t blow over if you get a lot of wind on your balcony. Holly – There are lots of varieties of holly available and they are nice for all year plantings. 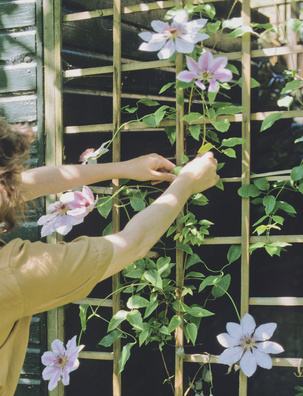 Ivy, Clematis and Hops – these are vining plants that grow quickly and can cover a balcony railing or trellis quickly. Junipers – there are several types of junipers that will do well in containers and grow to the height for a privacy screen. Viburnum – this is another flowering shrub that grows quickly. Its blooms have a wonderful smell in early summer. It does lose its leaves in winter. Check out other privacy screen plants for your hardiness zone. The National Gardening Association website at garden.org is a great resource. When you use their Plant Finder, you can enter your hardiness zone, type of plant (tree, shrub, etc) and then under special features, you can select “containers”, “hedge or screen”, etc to narrow your search. You can even go a step further and indicate the shape of plant you want. It is a great tool for annuals, perennials, trees, shrubs, etc. Return from Privacy Screen with Plants to Balcony Gardening.